Google Pixel 3 price in India starts at Rs. 71,000, and Pixel 3 XL starts at Rs. 83,000. Google Pixel 3 and Pixel 3 XL - the latest flagship smartphones from Google - were launched at the company's 'Made by Google' hardware event in New York on Tuesday. The search giant alongside unveiled two other products - the Google Home Hub and the Pixel Slate. The Pixel 3 and Pixel 3 XL come with various upgrades over their respective predecessors in terms of cameras, design, processor, and more. The Pixel 3 and Pixel 3 XL are not too different from each other, and the biggest differences are in terms of display, battery, and design. The Pixel 3 and Pixel 3 XL sport 5.5-inch and 6.3-inch displays respectively and come in three colour variants. The key highlights of the smartphones include Snapdragon 845 SoC, 4GB RAM, 12.2-megapixel rear camera, dual selfie cameras, and more. However, the most interesting thing that comes with the new Pixel handsets is the Pixel Stand for a fast wireless charging experience, that also enables the smartphones to be used at the same time. The new generation also gets a brand new colour variant, called Not Pink. 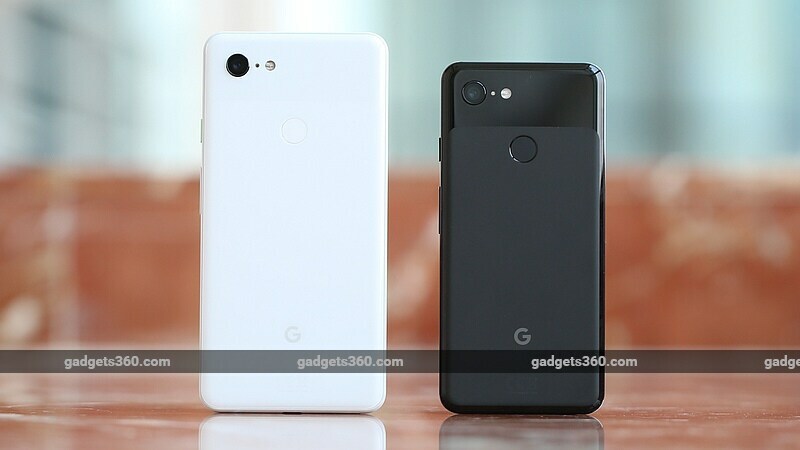 Google Pixel 3 price in India starts at Rs. 71,000 for the 64GB variant, going up to Rs. 80,000 for the 128GB variant. The Google Pixel 3 XL price in India starts at Rs. 83,000 for the 64GB variant, going up to Rs. 92,000 for the 128GB variant. The pre-orders for the Pixel 3 and Pixel 3 XL start from October 11 and they will then go on sale on November 1, via both online and offline stores. 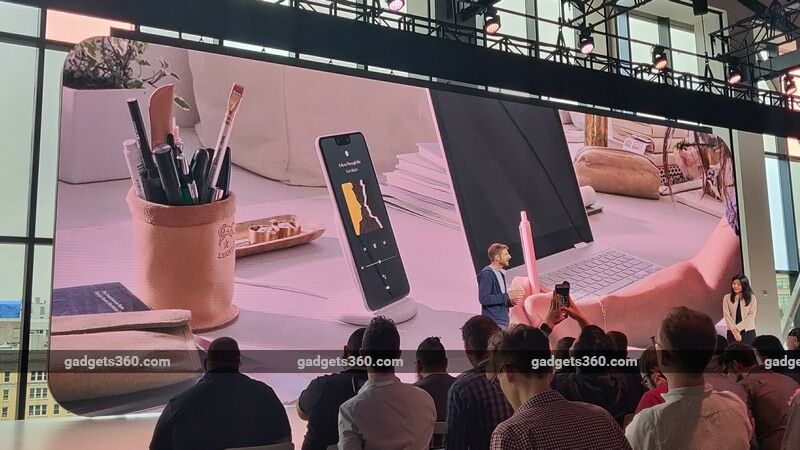 The Pixel Stand will also be available in India, and will be priced at Rs. 6,900. The company has listed Flipkart, Reliance Digital, Croma, Poorvika, Bajaj Electronics, and Vijay Sales as its retail partners. The company notes that the Pixel 2 XL (64GB) will continue to be sold at Rs. 45,499. As part of the pre-order offers, Google says consumers will be able to buy the Pixel 3 at no-cost EMIs starting from Rs. 3,944 per month. Current Google Pixel and Nexus phone owners will have special loyalty offers from Flipkart, as well as offline retail partners. Flipkart is also listing offers, including 50 percent buyback value if you upgrade to a new Pixel device within 12 months of purchase; Rs. 5,000 off on HDFC credit and debit cards, as well as netbanking; extra Rs. 4,000 off on exchange, and finally, no-cost EMIs up to 18 months. In the US, the Google Pixel 3 price starts at $799 (roughly Rs. 59,200) for the 64GB variant, going up to $899 (roughly Rs. 66,600) for the 128GB variant. The Google Pixel 3 XL price starts at $899, going up to $999 (roughly Rs. 74,000) for the 128GB variant. In the US, the Pixel Stand is priced at $79 (roughly Rs. 5,900). Notably, the Google Pixel 3 and Pixel 3 XL will be available in Clearly White, Just Black, and Not Pink colour models. Google says that the cameras in Pixel 3 and Pixel 3 XL are better than before, as they can capture "the best shot on the first try," with the new 'Top Shot' feature. The company claims that Group Selfie feature in the smartphones captures 184 percent more area of the scene than that of iPhone XS. Google has introduced a Night Sight feature for clicking images in low-lighting conditions. A Photobooth feature will also take shots of smiling subjects. The Pixel 3 smartphones come with exclusive in-camera Google Lens suggestions that work in real-time on URLs, emails, phone numbers, addresses, and QR codes. There is no requirement of mode switching nor an Internet connection. The new Pixel smartphones will also come with a new Google Assistant feature called Call Screen - the AI-powered feature will see the phone answer for you, ask who's calling and why, and then transcribe the conversation and show it on screen. It will be available for the Pixel 3 smartphones at launch, and will become available for other Pixel smartphones by next month. Once again, everything happens on device, using AI. Notably, the Pixel 3 and Pixel 3 XL are YouTube Signature devices. Another highlight feature is something called 'Now Playing', which is an always-on music identification feature. Google also announced that its Smart Compose feature will be coming to mobile first with the new Pixel smartphones. Google has brought the Digital Wellbeing features of Android 9.0 Pie to the Pixel 3 lineup. You can now just flip your smartphone face down to turn on Do Not Disturb with the new 'Shhh' gesture. The Digital Wellbeing Dashboard shows you how much time you spend on different apps. You can set timers for how much time you want to spend on an app and more. There is a new Playground feature that lets users put stickers and captions on images. It comes with 'Playmoji' characters that react based on users' facial expressions. The Pixel 3-Series handsets charge wirelessly with the Qi universal standard and fast with the Pixel Stand. The Pixel Stand can also turn the smartphones into a digital frame that displays your favourite albums from Google Photos while it charges. Both Pixel 3 and Pixel 3 XL are built with aluminium frame with hybrid coating, and apart from Corning Gorilla Glass 5 on the front to protect the display, the smartphones feature 'soft-touch' Gorilla Glass 5 on the back as well. Both come with an IP68 rating for water and dust resistance. For security, the Google Pixel 3 and 3 XL come with Titan M Security module, which is a custom-made, built-in security chip that protects sensitive on-device data by securing your lock screen and strengthened disk encryption. Google is providing Pixel USB Type-C earbuds that promise to provide "crystal clear sound", quick access to Google Assistant, and notification sounds. Both feature an M3/T3 HAC rating for hearing aid compatibility. They are 'Built for VR', and support the Google Daydream View headset. Both smartphones feature dual front-firing stereo speakers, 3 mics, and noise suppression technology. The single-SIM (Nano) Google Pixel 3 runs Android 9.0 Pie. The company is also touting the presence of eSIM support in select markets. The smartphone sports a 5.5-inch full-HD+ (1080x2160 pixels) flexible OLED display with 18:9 aspect ratio and pixel density of 443ppi (pixels per inch). It comes with Corning Gorilla Glass 5 protection and features Always-on Display technology. Additionally, features of the display include HDR support, 100,000:1 super contrast ratio, True black level, and it outputs full 24-bits depth or 16.77 million colours. The Google Pixel 3 is powered by a 64-bit octa-core Qualcomm Snapdragon 845 (four cores clocked at 2.5GHz and four cores clocked at 1.6GHz), paired with Adreno 630 GPU. It also comes with a Pixel Visual Core chip for the cameras. The smartphone is equipped with 4GB of LPDDR4x RAM. In terms of optics, the Google Pixel 3 houses a 12.2-megapixel dual-pixel camera with 1.4-micron pixel size, f/1.8 aperture, and a 76-degree field-of-view. The rear camera comes with features such as autofocus with dual pixel phase detection, optical and electronic image stabilisation, spectral and flicker sensor, and more. The rear camera is capable of shooting 4K videos at 30fps. The smartphone is equipped with a dual camera setup at the front. It bears an 8-megapixel wide-angle lens with f/2.2 aperture, 97-degree field of view, fixed focus, and an 8-megapixel normal lens with f/1.8 aperture, 75-degree field-of-view, and autofocus with phase detection. The front camera can should 1080p videos at 30fps. The Google Pixel 3 comes with 64GB and 128GB inbuilt storage options. Google is promising unlimited online storage for photos and videos, with original quality storage until January 31, 2022. Connectivity options in the Google Pixel 3 include 4G VoLTE, Wi-Fi 802.11 a/b/g/n/ac with 2x2 MIMO, Bluetooth v5.0 + LE, USB Type-C (v3.1) port, NFC, GPS/ A-GPS, GLONASS, Galileo, BeiDou, and Google Cast. Sensors on board the handset are accelerometer, ambient light sensor, barometer, gyroscope, magnetometer, and proximity sensor. It also features an Active Edge sensor and a back-mounted Pixel Imprint fingerprint sensor for fast unlocking. Google is also touting "advanced x-haptics for a sharper/ defined response." Under the hood, the Google Pixel 3 packs a 2,915mAh battery that is claimed to provide up to 7 hours of life with 15 minutes of charge. It comes with a USB Type-C 18W (USB PD 2.0) power adapter, 18W fast charging support (rated to deliver 7 hours of backup with as little as 15 minutes of charging), and Qi wireless charging support. Fast wireless charging is available with the Pixel Stand (seen below). In terms of dimensions, the smartphone measures 68.2x145.6x7.9mm and weighs 148 grams. There is no 3.5mm headphone jack, but the smartphone ships with a 3.5mm to USB Type-C adaptor as well as Pixel USB Type-C earbuds. The single-SIM (Nano) Google Pixel 3 XL runs Android 9.0 Pie. The company is also touting the presence of eSIM support in select markets. The smartphone sports a 6.3-inch QHD+ (1440x2960 pixels) flexible OLED display with 18.5:9 aspect ratio and a pixel density of 523ppi (pixels per inch). It comes with Corning Gorilla Glass 5 protection and features Always-on Display technology. Additionally, features of the display include HDR support, 100,000:1 super contrast ratio, True black level, and it outputs full 24-bits depth or 16.77 million colours. The Google Pixel 3 is powered by a 64-bit octa-core Qualcomm Snapdragon 845 (four cores clocked at 2.5GHz and four cores clocked at 1.6GHz), paired with Adreno 630 GPU. It also comes with a Pixel Visual Core chip for the cameras. The smartphone is equipped with 4GB of LPDDR4x RAM. The Google Pixel 3 XL has the same camera setup as the Pixel 3. It too comes with 64GB and 128GB inbuilt storage options, with Google promising the same unlimited online storage for photos and videos, with original quality storage until January 31, 2022. The connectivity options are also common between the Google Pixel 3 and Pixel 3 XL, as are the sensors on board. Like the Pixel 3, the Pixel 3 XL also has an Active Edge sensor, and a back-mounted Pixel Imprint fingerprint sensor. Under the hood, the Google Pixel 3 XL packs a 3,430mAh battery that is claimed to provide up to 7 hours of life with 15 minutes of charge. It comes with a USB Type-C 18W power adapter, 18W fast charging support (rated to deliver 7 hours of backup with as little as 15 minutes of charging), and Qi wireless charging support. As mentioned, fast wireless charging is available with the Pixel Stand. The smartphone measures 76.7x158.0x7.9mm and weighs 184 grams. Just like the Pixel 3, the Pixel 3 XL bears no 3.5mm headphone jack, but ships with a 3.5mm to USB Type-C adaptor as well as Pixel USB Type-C earbuds. Can Google Pixel 3 succeed in India without massive discounts? We discussed this on Orbital, our weekly technology podcast, which you can subscribe to via Apple Podcasts or RSS, download the episode, or just hit the play button below.